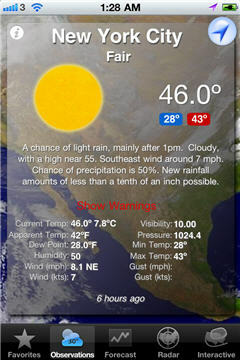 NEW United States of America Weather Information iPhone App that is accurate, intuitive and is fully equipped with all the weather information you need. 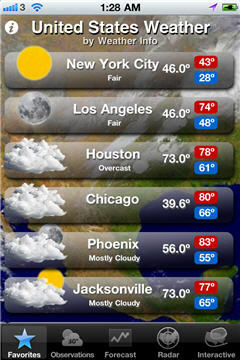 View your favourite places together with there current, maximum and minimum temperatures. Use this screen to view, add, delete or move places. This view has weather data for current location or you can scroll down to see near by places. It contains detailed information on temperature, wind, pressure and humidityl. 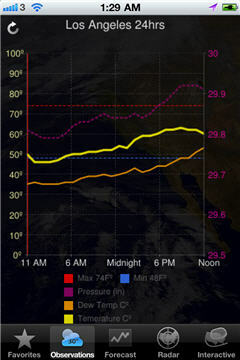 This chart shows today's temperature, dewpoint and pressure in a nice graphical interface. A view dedicated to Weather Warnings for the selected state. Click on any of the warnings to take you directly to NOAA warnings page for more information. View the weather forecast of up to 7 days where provided. 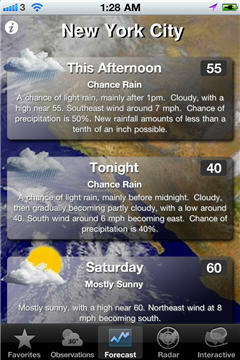 Also includes detailed information of forecasts. 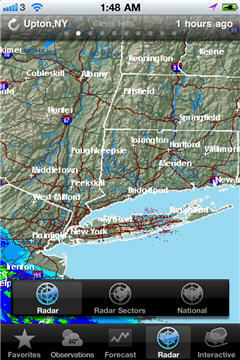 View all the weather radars also include larger section and national radar. Includes time since the radar was captured. 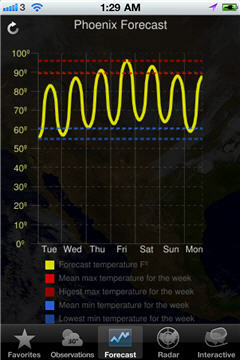 Forecast graph shows the weeks outlook temperature with the maximum and minimum forecast temperature for the week.. 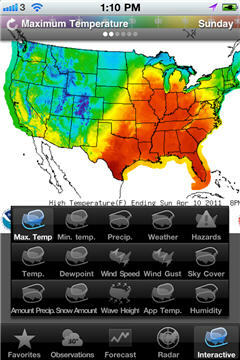 The interactive maps are excellent educational maps that show computer weather forecast patterns for the US.